Not much of a recipe today, more of a technique for how to smoke a ham. Now, I don’t no why we don’t cook hams more often, but for whatever reason, we don’t. And as far as I can recall, this is the first one we’ve ever done on the Egg. It’s not like they are hard. And they don’t take too long. I guess we don’t do them often because we don’t have enough people to eat on them. This past week, Mrs. G mentioned that she didn’t want traditional BBQ type food for the Texas Oklahoma game. No traditional meats, no bbq sauces and especially no potato salad or cole slaw. So we started brainstorming and she decided she wanted a ham. 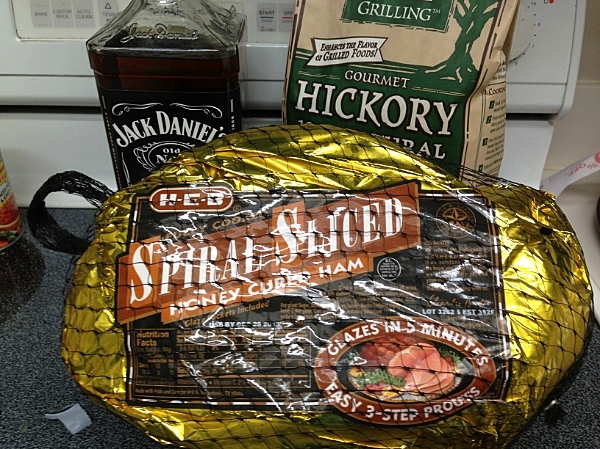 I wanted a plain, smoked ham (aka naked ham which we might cover later this year), but Mrs. G wanted a spiral sliced honey cured ham from HEB. What Mrs. G wants, Mrs. G gets. Happy wife, happy life. If you aren’t from Texas and don’t have an HEB or Central Market near you, just go with whatever brand your store carries. 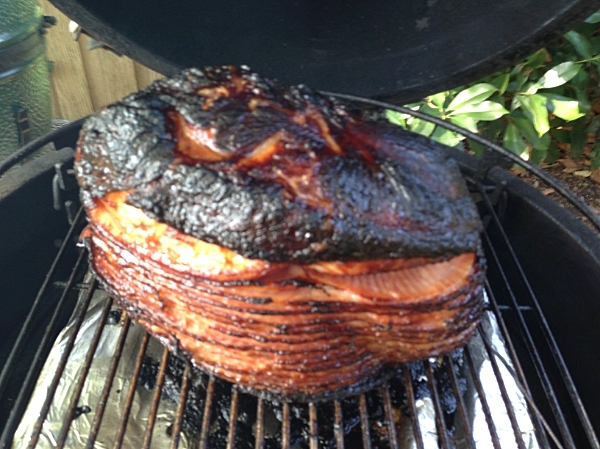 That is one pretty ham, don’t ‘cha think? These hams are already pre-cooked, so in reality, you aren’t cooking them. You are simply warming them up. So why bother to warm them up on the Egg or smoker? To introduce more smoke, of course! 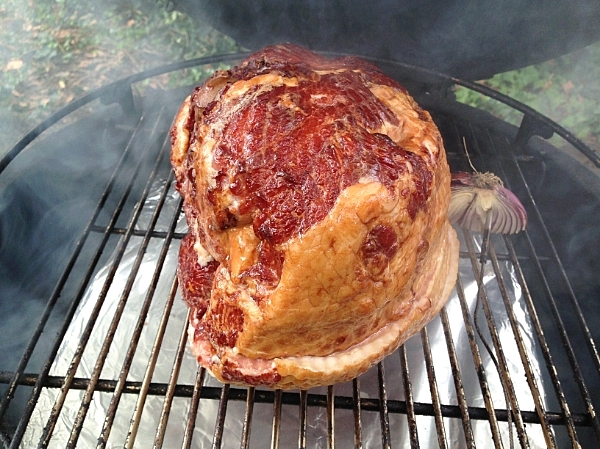 When you are ready to smoke your ham, set up your smoker for an indirect cook and stabilize it at 300F. We used the Adjustable Rig from the Ceramic Grill Store with the large oval stone (wrapped in foil for easier clean up) on the bottom level and the oval grate on the third level. If using the Big Green Egg plate setter, I would use it legs up with the original grate setting on top of that. For smoke, we decided to go with two small chunks of cherry wood and a handful of hickory. Allow the ham to warm up to 145F. Let me say once again, that the ham is already pre-cooked. You are just introducing smoke to it and warming it up. Once it reaches 145F, it is done. 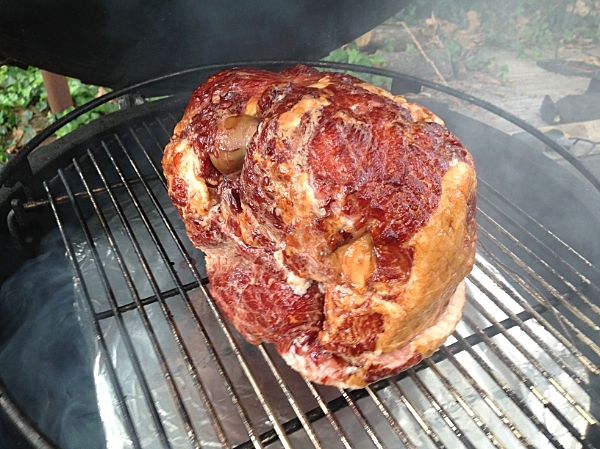 Our ham weighed in somewhere between 9 and 10 lbs and took about 2.5 to 3 hours to cook. If you are done early (which we were), simply wrap the ham in aluminum foil. Get a small cooler and line it with old towels (not the ones that are for guest or you will end up sleeping on the couch), place the ham in the cooler and place a few more towels on top of it. This will give you time to finish up your sides, or sit down and enjoy a cold beverage and hopefully watch your team whip up on their opponents. Two hours later, the ham will still be too hot to handle with bare hands, believe me. Once you are ready to eat, feel free to use the included glaze or make one of your own up if you are so inclined. Mrs. G took one bite of the ham and told me to forget about glazing it, that it was that good by itself. Happy wife, happy life. If you are looking for sides, nothing goes better with a ham than black eye peas, cornbread and maybe some scalloped potatoes and greens. That would be for another post, however. And once you are done eating and all the dishes are taken care of, feel free to pat yourself on the back, pour another cold one and enjoy what’s left of you day. You’ve earned it. I love this time of year. 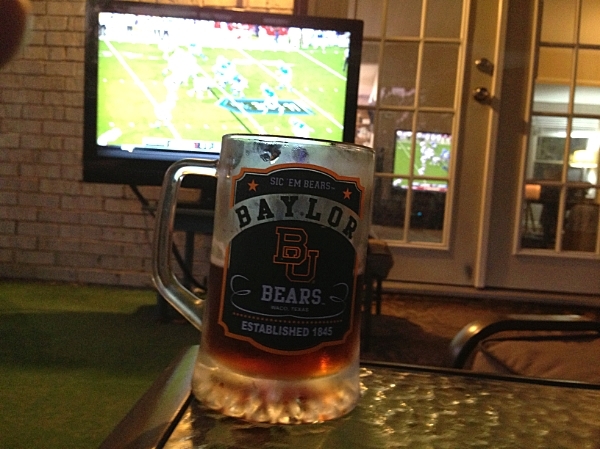 Football and cool weather. Does it get any better? Hopefully, you didn’t invite to many people over and there will be plenty leftover for sandwiches the next day. I know we have pleny leftover. I wonder what we could do with that this week? Hmmm…. That ham really looks terrific…. I have never heard of the ‘spiral sliced’ type before. I suppose you could insert stuff (fruit, mustard etc) between the slices? You very well could. Might try that next time. We thought we would keep it simple this time. Spiral sliced is perfect for making sandwiches later. Nice man! I’m with you, and love to smoke ham, but don’t seem to do it much. And your reasoning makes sense. That’s just a lot of meat to eat! Even for a manly man. Aw well. An excuse to invite people over for football then! Any excuse for inviting people over is a good one in my book. Looks nice. Hope it’s not boneless and that you saved the hock for soup. Have you considered smoking a fresh ham, vs. one that’s already cured? I’ve done it on my ‘beast’ a few times over oak, pecan and apple wood. Damn good stuff! It was bone in. We’ll do somethign with it for sure, no way would I just toss it. I have actually never seen a fresh ham before in the store. Mrs. G asked me why that was and I really don’t have a clue. Would love to try it. We did see a few country hams, but they were 20-24 lbs each. I don’t have that many friends. Huh. Weird. All I see are ones that say smoked or cured. Guess I need to look harder. Are they “enhanced” in any way, liquid with a water salt mixture like you see a lot of turkeys and chickens? No. They are packed in the same way that you’d see a pork roast. In fact, that’s where you’ll find them — near the pork roasts. Ask the meat manager. Will do. Thanks for the advice. No idea why I’ve never seen them before. What a great post – well almost – I always wanted to know how to smoke ham. As much food as we smoke, we’ve nevre done ham. I also am thrilled with the tip about coolers and towels. Only thing that doesn’t make me happy? The score Saturday! But, y’all beat the pants off us fair and square………I’m pretty sure most of our players never even got off the plane. Maybe next year! I’m pinning this! My favorite part of the ham is using the leftover bone for a great bean soup.